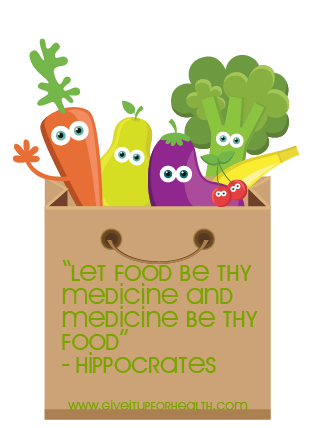 Hippocrates is often referred to as the "father of Western medicine", and despite the fact that he lived in an era known as "ancient Greece", his teachings on the impact of nutrition on health are as modern as ever. In fact they actually seem to be "beyond-modern" as his advice that food is medicine and prevention is better than cure are essentially ignored in the practice of modern medicine which relies almost entirely on the application of drugs and surgery only after disease has presented itself. Although not compulsory, most graduating medical students still recite a modern version of the ancient Hippocratic oath. If we tie the principle of prevention expressed in the Hippocratic oath illustrated on today's shopping bag, you have the essence of the mission statement for "Give it up for Health". The sad thing is that modern medicine just seems to be so far from the principle that "prevention is preferable to cure". And in the realm of nutrition, doctors (in the U.S. at least) are poorly trained in nutrition (more on that in a future post). The following "lifestyle" diseases all result from what is often referred to as the "Standard American Diet", and are all preventable and reversible with the adoption of a whole-food plant-based diet. The power is in our hands and what goes from hand to mouth, so why not Give it up for health! Do you think that doctors and modern medical practice adheres to the clause in the Hippocratic oath that says: "I will prevent disease whenever I can, for prevention is preferable to cure."